We have lovely handcraften silver pendants and hangers from India. Some are stone pendants set in silver(precious and semi Precious) some are simpley silver hangers with a depiction of an Indian God . All are exquisity crafted by a master craftsman with good working conditions in Jaipur India. Fairly traded. Pendant 4.50cm long excluding the loop. 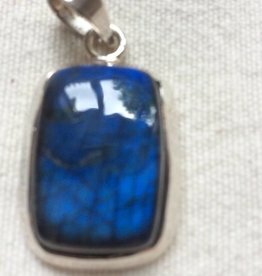 Beautiful labradorite cabouchon stone is hand cut and set in fine silver by a master silver smith with great working conditions in Jaipur. Fairly made. Heavy quality. 5 x 3.25cm excluding the loop. 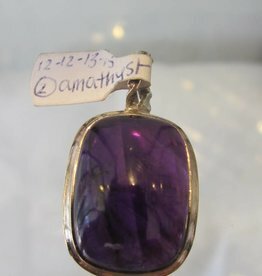 Beautiful piece of charoite (inspires service to the light) surrounded by silver. Hand produced by a master silver smith with goed working conditions in Jaipur. Fair trade. 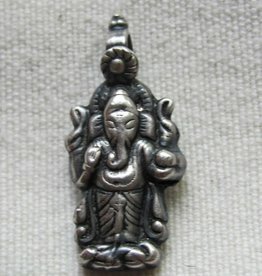 Silver pendant of Ganesh (Sweet Hindu God). The loop is big enough for a chain or piece of leather to pass through. Hand made in Jaipur in a workshop with great working conditions. Fairly made. 2.50cm including the loop. 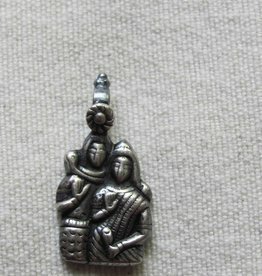 Silver pendant of Shiva and Parvathi. The loop is big enough for a chain or piece of leather to pass through. Hand made in Jaipur in a workshop with great working conditions. Fairly made. 2.50cm including the loop. 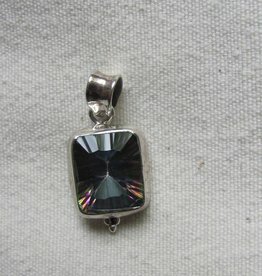 Zilver pendant, set with labradorite. 3cm long excluding the hanging loop. 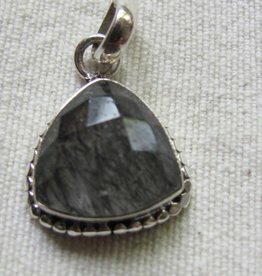 Pendant from silver with labradorite is hand made in Jaipur India in a workshop with good working conditions. Fairly made in India. Substantial piece of silver jewelry. In india elders feet and the guru are always respected. This pendant is of the Paduks- the feet of the guru. Nice solid quality that is meant to last a life time. Made in India in a workshop with good working conditions. 4.5cm inc. the hanging loop. 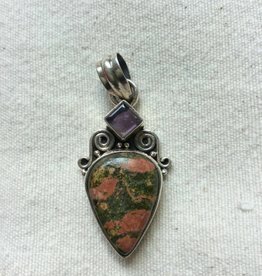 Pendant silver with rutile quarts. Pretty triangular model 2.50cm excluding the loop. 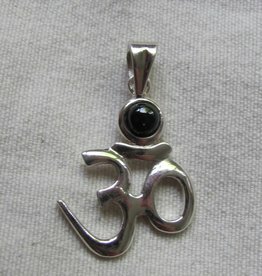 Hand faceted stone is set in fine silver by a master silversmith with fantastic working conditions in Jaipur. Fair trade. 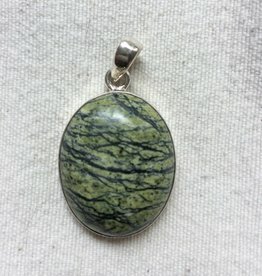 Pendant 2.50cm long. Special tube for (thick) chain or leather. Beautiful turquoise stone is hand cut and set in fine silver by a master silver smith with great working conditions in Jaipur. Fairly made. 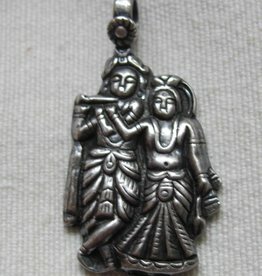 Silver pendant of Radha Krishna. The loop is big enough for a chain or piece of leather to pass through. Hand made in Jaipur in a workshop with great working conditions. Fairly made. 3.75cm including the loop. Pendant 2.75cm long excluding the loop. Beautiful labradorite cabouchon stone is hand cut and set in fine adorned silver by a master silver smith with great working conditions in Jaipur. Fairly made. Heavy quality. 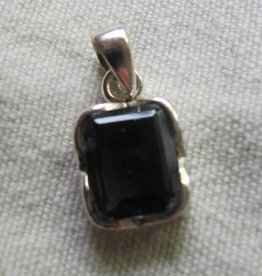 1.75 x 1cm hand faceted iolite stone set by hand in fijn silver by a master silversmith with good working conditions in Jaipur. Fairly traded. Superior quality stone. 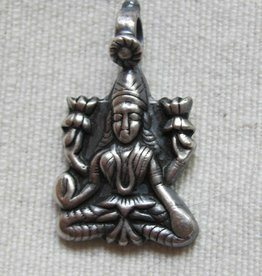 Silver pendant of Laxmi (Hindu Godess of wealth). The loop is big enough for a chain or piece of leather to pass through. Hand made in Jaipur in a workshop with great working conditions. Fairly made. 3cm including the loop. 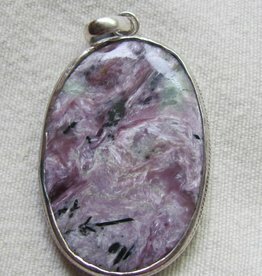 Cabochon polished beautiful dark amethyst set in silver. 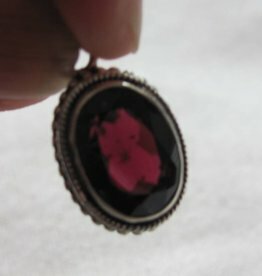 The pendant is open behind to optimalise the working of the stone. Measures: length x width 4 x 2 cm. Silver pendant made from 12 grams silver. Size is 5 by 4 cm, handmade. 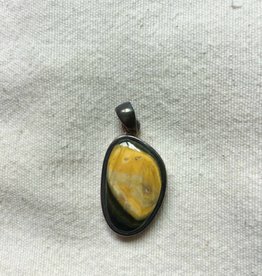 Pendant is hollow and lightweight to wear. Ganesh is the Hindu God that removes obstacles in your path with his trunk. 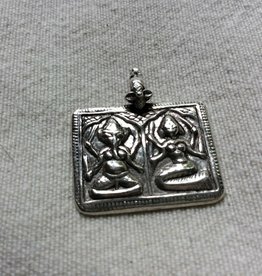 Silver pendant of Ganesh and Laxmi. Ganesh is the remover of obstacles. Laxmi the goddess of prosperity. Fairly made in a workshop with good working conditions in Jaipur, India. Hight 3cm (including the integrated fastening loop) width 2.50cm. Pendant 3cm long excluding the loop. 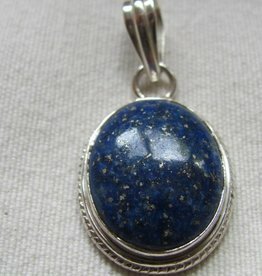 Beautiful lapis lazuli cabouchon stone is hand cut and set in fine silver by a master silver smith with great working conditions in Jaipur. Fairly made. Heavy quality. 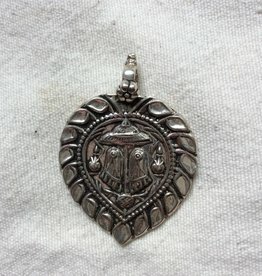 Silver pendant of Shirdi Baba. The loop is big enough for a chain or piece of leather to pass through. Hand made in Jaipur in a workshop with great working conditions. Fairly made. 3.50cm including the loop.